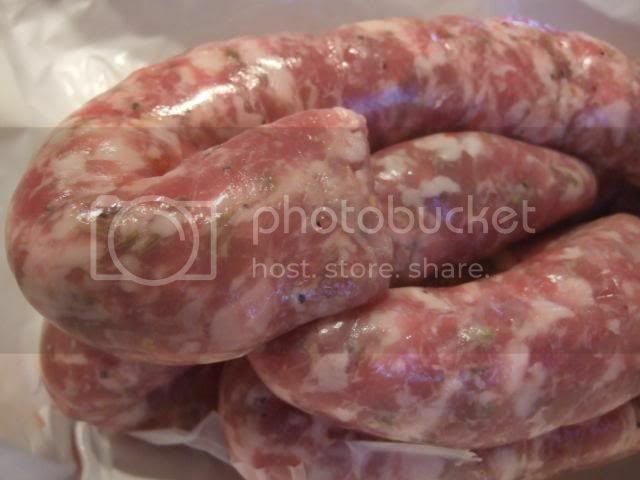 Just joined, and I searched the forum, but the sausages being discussed were more ethereal: My question is where to find plain old Italian sausage, the one made from pork butts, white pepper, and fennel seed. And that's about it. Most places either add hot pepper (even to the mild sausage) or other flavorings (sugar is really popular). This is part of the general over-gussying-up of Italian cooking these days. Paulina Market makes a good mild Italian--but it is ground too fine. That must be the German influence--as the knackwursts and bratwursts are very finely ground there. Of course, my life must be really hard if one of my worries is Italian sausage stuffed with pork ground too fine. Any advice on where to find this staple? Well, if that isn't a perfect segue to a Bari post, I don't know what is. Much as I respect Paulina, let's face it, if Germans knew how to make Italian sausage, the history of the 20th century would have been very different. Bari Foods is to Italian foodstuffs what Paulina is to German-American, an old school, no-nonsense place with nothing yuppie about it, but high standards and discriminating taste in the products they offer. They make their own Barese sausage, I don't know if it has fennel seed in it or otherwise compares to your ideal, but tonight I'll make what I bought there yesterday and report back. Besides the homemade products, the great glory of a trip to Bari is getting a Bari sub. High quality meats on a D'Amato roll which probably came from the oven next door within the previous hour or two (mine was still warm yesterday), seasoned with oil and herbs. Most people get giardinera on them, and Bari's homemade giardinera (hot, medium or mild) is said to be excellent, but I'm not a big fan of peppers on sandwiches and, more to the point, I like the slightly dry, meat and cheese elementalness of a sub without them. (It goes without saying that you don't want mayo, mustard, or any of that stuff on it, though GWiv suggests the artichoke hearts.) Getting one is sometimes a bit of an ordeal, as the family never seems to have heard of those little red devices that spit out numbers and you have to stand in the back, memorize exactly who was there before you, and be ready to jump at your turn without inadvertently offending some 290-lb. Streets and San worker by cutting in front of him, but it's all worth it: I only got as far as my car, parked a little ways up May street, before I decided I couldn't wait and ripped my white paper package open to start devouring it in the car, savoring the surprising lightness, delicacy and freshness of one of the best sandwiches on earth. Every other sub seems like a mere gut bomb by comparison. As noted, Bari is next door to the D'Amato's which has a grandfathered-in coal-fired oven, and thus makes one of, if not THE, best breads in Chicago, a simple white loaf with a hard, slightly burnt-tasting crust, cracked like the glaze on an undiscovered Fra Lippo Lippi in a monastery in Umbria. Bari and D'Amato's, two essential stops on Chicago's Italian dining scene. D'Amato's #1 Italian and French Bakery Co. Agreed, though the Barese sausage at Bari and elsewhere is heavy on the garlic. It's unusual to see someone looking for something more plain when were talking sausage, but I think the man should get what he wants. If he's willing to buy a bunch of it, I'd bet the good people behind the counter at any number of stores around town, Italian, German, Polish or otherwise, would custom fill some sausages to these specifications. Speaking of sandwiches, Bari delivers to the Loop. Also, if you're looking for a Bari-like sammy, but in giant proportions on a mammouth but drop-dead-perfect, custom crafted loaf of bread for tailgating or whatnot, Caputo's is the place (Conte di Savoia too, but the bread is not as good). We just had some mild italian sausage from Caputo Cheese market. It was excellent, although we have a suspicion they may have added hot pepper to the mild version, but it wasn't overwhelming, it only hit in a few spots. So I had my Bari sausage yesterday. Yes, I would say it had some garlic, it also had some green leaf which was presumably parsley, so I don't know how canonical it was. But it tasted plenty good. Bari also sells regular Italian sausage, which is equally good. I don't believe their mild has any red pepper in it, and the pork is a coarser grind than many places. I like the hot sausage, but the mild is very, very good. Bari's Barese is fantastic as well. The garlic smell is quite potent--I took five pounds of it home on the metra once, and felt pretty bad about the strong (not unpleasant, at least to me, but strong) aroma coming from my briefcase. If I'm not mistaken (and I often am, so take it for what it's worth) barese sausage is made from lamb, as well as pork. I like Nottoli Sausage Shop at 7652 W. Belmont in Chicago. They usually do three or four different sausages, including one with fennel seed (though I think they use a little too much fennel), a garlic sausage, and a plain "salt and pork shoulder." I think there was a Barese last time I was there (smaller diameter, in lamb casing, with basil). They have good sandwiches and arancini, too (get the small ones). Joseph's Food Mart at 8235 W. Irving Park is pretty good, too. Joe at Joe The Sausage King (gotta love that as a name for a store) also makes Italian sausage, though I have yet to sample it. When it comes to sweet Italian sausage I prefer Joseph's on West Irving. Before Harlem. Really good, with the flavor of fennel shining through. But when I want both hot and sweet, I head to Ginos on N. Harlem. Right next door to Pasta Fresh - one stop shopping IMO. They also have the best dried sausage I've ever had. I go out of my way for it. It's that good. 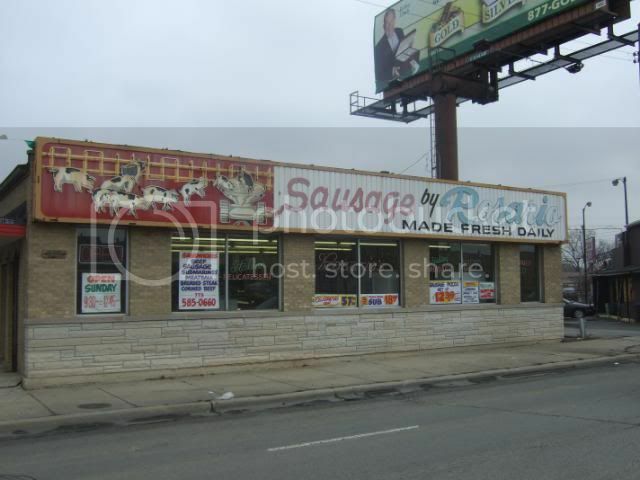 I've yet to find good Italian sausage in the Lincoln Square, Ravenswood-area - I keep getting let down, time and time again. I concur with the recommendation of both Nottoli and Ginos. Gino's also carries pork bracioli that can just be dropped in a pot of sauce with little preparation. I also think that Riviera on Harlem near Belmont makes a fine sausage. It breaks up beautifully after being slow cooked in a red sauce. Any updates on this thread? I am in the market for some Italian sausage and I am thinking of visiting one of these places. I see Nottoli is still open but have lost track of some others. The last italian sausage I got at the supermarket I threw out it was so awful. I was at Nottoli yesterday.They are still going strong and they had all the sausage one cold have wanted. This thread is almost 11 years old! I don't know much about Italian sausage but I can recommend the Wurst Kitchen in Aurora for sausages of all kinds. I have know the family over time, nice people and they also run a shop in Plano. They do farmer's markets and fairs but their main shop is charming and they know their stuff!! Only been around over 100 years plus!! LikestoEatout wrote: This thread is almost 11 years old! I don't know much about Italian sausage but I can recommend the Wurst Kitchen in Aurora for sausages of all kinds. I have know the family over time, nice people and they also run a shop in Plano. They do farmer's markets and fairs but their main shop is charming and they know their stuff!! Only been around over 100 years plus!! I was in Aurora the other day and almost went to Wurst Kitchen. I need to eat that moment and I had the impression eating-in wasn't an option. Was I mistaken and could have eaten in? No. It's a butcher shop. No cooked food and no tables. Great sausage, though. I know the thread is old. I am not sure if you are supposed to start a new thread or just find one and get it updated. As noted upthread Caputo's makes sausage in house and it's pretty good. For a change of pace the Barese is really good. I like Rosario's - just south of GNR Viti & Nick's. It has the requisite fennel and is a course grind. Good pizza set-ups. I like Tony's Finer Foods Italin sausage. It is made in house and has just the right spices in a large grind. scott E. wrote: I like Tony's Finer Foods Italin sausage. It is made in house and has just the right spices in a large grind. The ingredient list calls for "4 garlicky pork sausages, like mild Italian," so we went to the TFF on Greenwood in Niles a week or so ago, because they seem to have more types of sausage there than you can shake a stick at. However, DH and I could not find what was described; when I inquired at the deli counter, I was pointed to a nearby case where the only thing we found was individually wrapped Boar's Head brand "Dry Mild Italian Sausage." I didn't think that was what the recipe was describing, but I was tired of looking at that point, so we purchased two of them and called it a day. Well, my cooking plans changed, so fast-forward a few days; we made a trip to Jewel, and there in the meat department were uncooked Italian sausages of a few different varieties, including "mild." "Aha," I said, "I'm pretty sure this is what the recipe ingredient list was referring to." So, we bought a pack (I think it was the Johnsonville brand) and that's what I used for the recipe. The dish was pretty tasty, but I thought the texture of the sausage was a tad mealy. I'd like to make it again, but with a better-quality sausage. Of course, now I also have the dried sausage that I'm not quite sure what to do with, so any suggestions for how to use them would also be appreciated! funkyfrank wrote: I like Rosario's - just south of GNR Viti & Nick's. It has the requisite fennel and is a course grind. Good pizza set-ups. if Italian Sausage is the star of the dish, Rosario's is where I hike over to. Do a Google search for Minelli meat and Deli in Niles. Should be just what you're looking for. I had pulled some Minelli's medium-hot Italian sausage out of the freezer the other day, but hadn't gotten around to cooking it. Under the deft hands of Mr. X, lunch today was rotini with a good marinara (not sure of the origin -- this was Mr. X's meal) and three good chunks of fennel-seeded, flavorful sausage. It was a good lunch.